Chris Brown writes about how Peyton Manning has improved as he has aged into a 37-year-old quarterback with a second life. Hit the jump for Karolina Kurkova wearing wings! Projection: Weakside linebacker. Thompson plays like a middle linebacker, but his body seems more suited to the weakside linebacker position, where he might be able to get away with being 6'1" and fairly light. I do not see him as a dynamic player at the next level, and he seems like someone who would be a depth player or a developmental prospect who might be able to step into a role later in his career. Thompson lacks ideal closing speed and does not show the necessary instincts to make up for a lack of elite athleticism. For whatever reason, I envision him playing for a team like Cincinnati. Reminds me of: Obi Ezeh. Ezeh was one of those guys who often seemed to be a hair late or a step too slow to make the play, and I'm not sure if Thompson is that guy who can lasso running backs in the hole. He appears to be more successful when he attacks rather than reacts, but college coordinators won't blitz him on every down. I did think Ezeh was miscast as a middle linebacker when he should have been playing on the strong side, whereas Thompson is a little lighter and should probably stay on the weak side, either in a 4-3 Under or perhaps as a weak outside 'backer in a 3-4. Likelihood of committing to Michigan: As mentioned above, Tyriq's father was a Michigan safety in the mid-1990's. Michigan State was taking the lead prior to Michigan's offer, but now certain insiders believe that Michigan can and will pull ahead for his commitment. Either way, it appears to be a two-horse race between the in-state schools. "If you're wearing Google Glass, you've already lost at life. Of course it was you, Golden Tate." Hit the jump for a girl in a tight bluish-green-ish dress. pursue a track career instead of football. As a lifelong sports fan, I'm always intrigued by athletes' sons maturing into young men. Will they be better or worse than their dad? Bigger or smaller? Will they go to the same school or forge their own path? This is the third in a yearly series (2012, 2013). If you have any other father-son combos to add to the list for 2014, let me know and I'll add them to the post. Dillon Bates - OLB - Ponte Vedra Beach (FL) Ponte Vedra: Bates is a 6'3", 220 lb. player who chose Tennessee over offers from Alabama, Florida, Ohio State, Texas, and many others. He's a 247 Composite 4-star, the #7 outside linebacker, and #95 overall and played in the Under Armour All-American Game last Friday. His father Bill was a Dallas Cowboys safety from 1983-1997 and ended his career with 667 tackles, 18 sacks, and 14 interceptions. He was also a four-year starter at Tennessee in college. Orlando Brown, Jr. - OT - Suwanee (GA) Peachtree Ridge: Brown is a 6'8", 338 lb. player who chose Tennessee over offers from Alabama, Auburn, Clemson, Florida, Florida State, Georgia, Michigan, Notre Dame, Ohio State, South Carolina, Texas, and USC, among others. He's a 247 Composite 3-star, the #37 offensive tackle, and #449 overall. Brown recently played in the Offense-Defense All-American Bowl. His father, nicknamed "Zeus," was an offensive tackle for the Cleveland Browns and Baltimore Ravens from 1993-2005. He was also a participant in an ugly incident as a member of the Browns, when he was hit in the eye by a penalty flag and then pushed an official to the ground. The elder Brown died of complications from diabetes. Randall Cunningham II - QB - Las Vegas (NV) Bishop Gorman: Cunningham is a 6'5", 185 lb. player with offers from Arizona State, Baylor, Kansas State, LSU, Mississippi State, Syracuse, UNLV, and Utah. He's a 247 Composite 3-star, the #17 dual-threat quarterback, and #576 overall. As a senior in 2013, he completed 116/204 passes for 1,773 yards, 16 touchdowns, and 8 interceptions; he also ran 167 times for 1,424 yards and 14 touchdowns. However, he has accepted a track scholarship to USC due to his abilities as a high-jumper, so his future football career is in question. His father attended UNLV and was drafted in the 2nd round of the 1985 NFL Draft by the Philadelphia Eagles. He threw for 29,979 yards, 207 touchdowns, and 116 interceptions with the Eagles, Minnesota Vikings, Dallas Cowboys, and Baltimore Ravens from 1985-2001. Naijiel Hale - CB - Bellflower (CA) St. John Bosco: Hale is a 5'11", 175 lb. prospect who chose Arizona over offers from Cal, Nebraska, Utah, and Washington, among others. He's a 247 Composite 4-star, the #23 cornerback, and the #314 player overall. As a junior in 2012, he had 50 tackles and 4 interceptions. Now he'll be playing for former Michigan head coach Rich Rodriguez. His father, Nate Dogg, was a rapper who collaborated with Snoop Dogg, Warren G, and Dr. Dre. He also had his fair share of legal troubles and then died of complications from multiple strokes in 2011. I get that Nate Dogg wasn't a famous athlete, but I couldn't help including him. Marlon Humphrey - CB - Birmingham (AL) Hoover: Humphrey is a 6'1", 175 lb. prospect who chose Alabama over offers from Auburn, Clemson, Florida, Florida State, and numerous others. He's a 247 Composite 5-star, the #3 cornerback, and the #12 player nationally. As a senior in 2013, he had 35 tackles and 3 interceptions. Humphrey's father is Bobby Humphrey, a former Crimson Tide running back who was taken in the first round of the 1989 NFL Supplemental Draft by the Denver Broncos. He had 2,857 rushing yards and 15 touchdowns for the Broncos and Miami Dolphins before off-the-field troubles drove him out of the game. Bobby was such a good football player that he was in Tecmo Super Bowl. Gelen Robinson - DE - St. John (IN) Lake Central: Robinson is a 6'2", 232 lb. prospect who chose Purdue over offers from Illinois, Indiana, Minnesota, Missouri, Vanderbilt, and a few others. He's a 247 Composite 3-star, the #26 strongside end, and #618 overall. As a junior in 2012, he had 95 tackles, 47 tackles for loss, and 13 sacks. His father Glenn Robinson attended Gary (IN) Roosevelt and earned a scholarship to Purdue where he averaged 27.5 points, 9.7 rebounds, 1.9 assists, 1.8 steals, and 1 block per game, and he hit 38.5% of his three-pointers. He was the #1 overall pick by the Milwaukee Bucks in the 1994 NBA Draft and went on to an 11-year pro career with the Bucks, Atlanta Hawks, Philadelphia 76ers, and San Antonio Spurs. For his professional years, he averaged 20.7 points, 6.1 rebounds, 2.7 assists, 1.2 steals, and 0.6 blocks, and he hit 34% of his threes. Gelen's brother Glenn Robinson III is a sophomore basketball player at Michigan, where he's averaging 13.6 points, 4.4 rebounds, 1.4 assists, 1 steal, and 0.3 blocks per game this season. Quentin Tartabull - S - Mission Hills (CA) Bishop Alemany: Tartabull is a 5'11", 190 lb. prospect who chose Cal over offers from Hawaii and Minnesota. He's a 247 Composite 3-star, the #63 safety, and the #773 prospect overall. As a junior in 2012, he had 125 tackles and 6 sacks. His father, Danny Tartabull, was a second baseman, outfielder, and designated hitter for the Seattle Mariners, Kansas City Royals, New York Yankees, Oakland Athletics, Chicago White Sox, and Philadelphia Phillies from 1984-1997. He was a career .272 batter with a .368 on-base percentage, 262 home runs, and 925 runs batted in. An all-star in 1991, he finished #5 in Rookie of the Year voting in 1986 (losing to Jose Canseco), #12 in MVP voting in 1991 (losing to Cal Ripken, Jr.), and #17 in the MVP race in 1987 (losing to George Bell). Unfortunately, Danny has been in trouble for failing to pay $276,000 in child support for Quentin and his brother Zach. Quentin's grandfather (and Danny's father) Jose Tartabull was also a MLB player who had 2 home runs, 107 RBI's, and 81 stolen bases for the Kansas City Athletics, Boston Red Sox, and Oakland Athletics from 1962-1970. A throw by Jose in the American League Championship Series inspired a novel called Tartabull's Throw. Justin Stern talks about the relationship between junior fullback Sione Houma and incoming freshman defensive tackle Bryan Mone. Hit the jump for Shelby Chesnes in an interesting bikini. Ray Vinopal had arguably the best season of any former Michigan player. S/LB Isaiah Bell: Bell played for Lake Erie College and ended the year with 14 tackles, 1.5 tackles for loss, 1 sack, 1 forced fumble, and 1 fumble return for a 97-yard touchdown. His college career is complete. TE Pharaoh Brown: Brown missed the early part of the season due to injury, and he finished the year with 10 catches for 123 yards (12.3 yards/catch) and 2 touchdowns. His two touchdowns came in the only two losses Oregon suffered, so I bet Ducks fans hope he goes scoreless next year. He will be a junior and likely full-time starter in 2014. CB Cullen Christian: Christian made just 2 tackles as a backup defensive back at Pitt this year. He will be a fifth year senior in the fall. CB Gareon Conley: Conley redshirted as a freshman at Ohio State. He will be a redshirt freshman in the fall. CB Dallas Crawford: Crawford became Miami's starter after Duke Johnson got hurt. Crawford finished the season with 137 carries for 558 yards (4.1 yards/carry) and 12 touchdowns, caught 20 passes for 171 yards (8.6 yards/catch) and 1 touchdown, and returned 4 punts for 27 yards (6.8 yards/return). He will be a redshirt junior in the fall and will likely return to backup duty behind Johnson. S Vladimir Emilien: As a backup outside linebacker for the Toledo Rockets, Emilien ended the year with 15 tackles, 2 tackles for loss, 1 sack, and 1 fumble recovery. His college career is finished. K Anthony Fera: Texas's starting placekicker and punter was 20/22 (90.9%) on field goals and 45/46 (97.8%) on extra points. He also averaged 40.7 yards on 75 punts. His college career is complete. K Matt Goudis: Goudis was 13/17 on field goals (76.5%) and 57/57 on extra points for Miami. He also averaged 64.3 yards/kickoff on 4 attempts. OT Jake Fisher: Fisher started ten games at right tackle for Oregon. He will be a senior in the fall and presumably return to his starting right tackle spot. S Carvin Johnson: Johnson ended the year second on Hampton's team with 122 tackles, 4.5 tackles for loss, 3 interceptions for 59 yards, 6 pass breakups, and 2 fumble recoveries. His college career is done. LB Mike Jones: Jones was third on his Western Michigan team with 92 tackles, adding 5 tackles for loss, .5 sacks, 1 pass breakup, and 1 fumble recovery. His college career is finished. WR/TE Ricardo Miller: Miller started two games and played in a total of six, finishing with 5 receptions for 52 yards (10.4 yards/catch) for UMass. His college playing career is complete. LB Kaleb Ringer: Ringer played linebacker in six games for Ferris State and made 14 tackles with 1.5 tackles for loss. He will be a redshirt sophomore in the fall. WR Jerald Robinson: Robinson led his Walsh University team in all categories with 38 catches for 499 yards and 7 touchdowns. He will be a fifth year senior in the fall. S Marvin Robinson: Robinson led Ferris State in tackle with 89, adding 1 tackle for loss, 1 interception, and 1 pass breakup. His college playing career is over. DE Chris Rock: Rock played in one game for Ohio State against Florida A&M but did not record any statistics. He will be a redshirt junior in the fall. WR Je'Ron Stokes: Stokes was part of a meager passing game at Norfolk State, where he caught 15 passes for 158 yards (10.5 yards/catch) and 1 touchdown. He also had 1 carry for 2 yards and returned 7 punts for 43 yards (6.1 yards/return). His college playing career is over. S Ray Vinopal: Vinopal started at free safety for the Pitt Panthers and ended up second on the team with 83 tackles, adding 3 tackles for loss, 1.5 sacks, 3 interceptions returned for 60 yards, 6 pass breakups, 2 forced fumbles, and 1 fumble recovery. He has one year remaining at Pitt, where he will presumably start once more. CB Adrian Witty: Witty started most of the year at free safety for Cincinnati, ending the year with 46 tackles, 3 tackles for loss, 1 interception for a 41-yard touchdown, and 4 pass breakups. He has one year remaining at Cincinnati, where he will presumably return as a starter. Nick Baumgardner has a piece on Chase Winovich and why he went from Ohio State fan to Michigan commit. Hit the jump for Jell-O shots. This doesn't feel quite so warm and fuzzy anymore. I was going to save this for tonight's 10 p.m. post, but I might as well get it posted right now since people want to discuss it: In some bad news for several parties, kicker Brendan Gibbons was expelled from the University of Michigan in late December for alleged sexual misconduct. 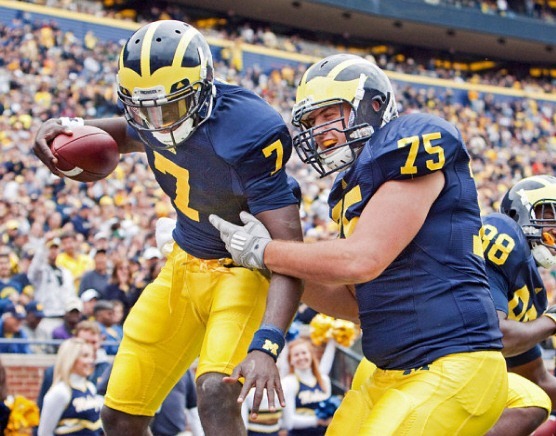 Poll results: What position does Michigan need to recruit most in 2014? The coaches are still recruiting Southfield (MI) Southfield defensive end Malik McDowell, but it appears to be McDowell or bust. The only other uncommitted players are two southern kids who are going to stay down south. Sarasota (FL) Booker's Marlon Mack committed to Louisville yesterday, and the coaches have stopped recruiting Minneapolis (MN) Washburn's Jeff Jones. Jones apparently does not plan to take his qualifying standardized test until March, which makes signing in February questionable. All other options are off the table unless the coaches offer someone new. The program just lost fifth year senior Josh Furman to a transfer, and I wanted Mack in the class partly for his abilities on the defensive side of the ball. 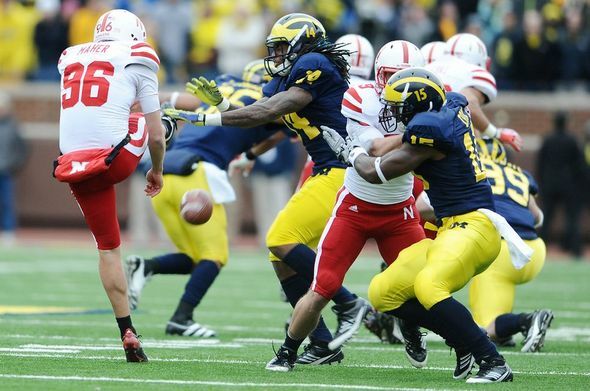 However, Michigan has some cornerbacks who can potentially switch positions. Michigan is only bringing in two offensive linemen in this class, but with zero linemen scheduled to graduate in 2014 and a 2013 class that included six linemen, this isn't a big spot of need. The Wolverines already have three commitments in this class, and while new offensive coordinator Doug Nussmeier might spread it out a little more than Al Borges did, they'll still use tight ends and H-backs, so there's not a big need for more receivers. I would have moved quarterback up on this list if I were prioritizing, because I'm not sold on Wilton Speight as a future starter. The Wolverines have recruited a ton of tight ends and linebackers in recent years, so they're fine there. Cornerback is another position that has been recruited a great deal in recent years, and along with scholarship specialists Matt Wile and Will Hagerup, the Wolverines have brought in some quality walk-ons in the form of Kenny Allen and J.J. McGrath. Athletic director Dave Brandon talks about the coaching search that brought Brady Hoke to Michigan. Hit the jump for a girl in workout shorts. I apologize for not having a name to address this comment to. I played for U of M '71-'74 and was MVP as middle linebacker for the 1974 season. This year we celebrate 40 years and are combining our reunion with the dedication of a Bo Schembechler statue. The first of its kind on the U of M campus. In an effort to include everyone we are looking to invite all of our old coaches. I saw the article about Dennis Brown and thought you might have his phone number or way to reach him. I am also going to give you a list of all the coaches and ask if you could help us locate them. Any help like even the city they now live in would be great. Thanks for any help you can provide. Should be a lot of fun. So people of the Michigan blogosphere, if you have any information for the men listed, please e-mail me (touchthebanner at gmail dot com) or leave any general info on whereabouts in the comments (such as cities, not home addresses or phone numbers). Thanks, and hopefully it will be a successful reunion for the 1974 team, which went 10-1 on the way to a Big Ten co-championship and a #3 ranking. Go Blue! Safety Josh Furman, who would have been a fifth year senior in 2014, has decided to leave the program one year early, joining running back Thomas Rawls and defensive tackle Richard Ash in departing. Furman committed to Michigan in December 2009 over teams like Oklahoma and Virginia Tech. I did not write a commitment post for him at the time, as the blog was still in its infancy stages. However, I did write a scouting report on him the previous month. At the time, I assumed he would bulk up and turn into a linebacker, and once he signed with the Wolverines, I thought he would play on the weakside. You may notice that I questioned his coverage abilities and said he would be too stiff to play defensive back in college. Players who move back in a defense (from DE to LB, or from LB to S) tend to struggle more, and Furman is no exception. He had the potential to be a quality linebacker for the Wolverines, but he turned into a below average safety. 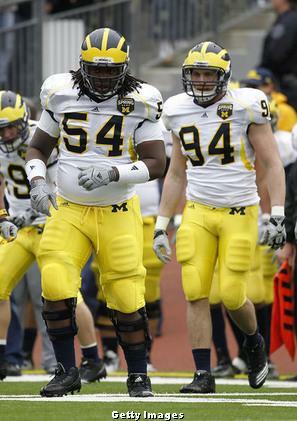 Furman never added the weight to become a linebacker and finished his Michigan career as a 6'2", 202 lb. safety. With starting safety Thomas Gordon suspended to begin the year, Furman made his first career start in the opener and went on to start three games this past season. Altogether, he finished with 11 tackles and 1 pass breakup on the season. In 30 games played over his career, he totaled 29 tackles and the 1 pass breakup. Most of those tackles came on special teams coverage, which was perhaps the best trait he provided to Michigan during his career. It is unclear where Furman will end up, but most players end up transferring closer to home. Perhaps he'll end up at Maryland or Temple, or he might even move down a level to play in the FCS. He's the 19th member of the 27-man 2010 class to depart before running out of eligibility. Michigan is left rather thin at safety with Furman's departure and the graduations of Thomas Gordon and Courtney Avery. The Wolverines return one starter in the form of junior Jarrod Wilson, but other contributions will have to come from untested players like redshirt sophomore Jeremy Clark, sophomore Dymonte Thomas, sophomore Delano Hill, position switchers, or freshmen. My initial expectation is that Wilson and Thomas will be the starters at safety next season. Fort Lauderdale (FL) University School defensive end Richard Yeargin III decommitted from Notre Dame. He probably would have been an outside linebacker for the Fighting Irish, but he's expected to end up at Clemson now, where I believe he will be a defensive end. Corona (CA) Santiago quarterback Blake Barnett was offered by Michigan. He's a 6'3", 195 lb. prospect with offers from Arizona, Cal, and UCLA, among others, and he has been committed to Notre Dame since last November. According to 247's Composite rankings, he's a 4-star, the #6 pro-style QB, and the #135 player overall. As a junior in 2013, he passed for 2,332 yards and 22 touchdowns, and he ran for 695 yards and 13 touchdowns. He runs a spread offense in high school and has a good combination of throwing and running abilities. Following Michigan's offer, he stated that he was solid with Notre Dame but would check into what the policy is on taking other visits, so the offer appears to have stirred at least a little bit of interest. Princeton (NJ) Princeton running back Johnny Frasier was offered by Michigan. He's a 5'11", 200 lb. prospect with offers from Georgia, North Carolina, and Penn State, among others. According to the 247 Composite, he's a 3-star, the #57 running back, and #651 overall in the class. As a sophomore in 2012, he had 229 carries for 1,792 yards and 21 touchdowns, plus 13 catches for 194 yards and 2 more scores. Frasier has decent speed and vision, but his biggest asset might be his balance; he doesn't run over tacklers, but he bounces off and keeps moving forward. Berea (KY) Madison Southern running back Damien Harris decommitted from Michigan. Harris had been committed to the Wolverines since summer 2013, but the poor season combined with the departure of offensive coordinator Al Borges has made him rethink some things. His mother went on the record saying that the Wolverines are still #1 on Harris's priority list, but it's rare that kids decommit from a school and then end up signing with that school, the stories of David Dawson and Will Campbell be damned. One school that may benefit is Ohio State, which was high on Harris's list before he chose the Wolverines; however, Michigan was his childhood favorite, so hopefully the 247 Composite #2 running back stays true to his youth. Cedar Hill (TX) Cedar Hill wide receiver DaMarkus Lodge was offered by Michigan. He's a 6'2", 190 lb. prospect with offers from Auburn, Baylor, Ohio State, Oklahoma, Oklahoma State, Texas, Texas A&M, and Texas Tech, among others. He's a 247 Composite 4-star, the #3 WR, and the #52 player overall. As a junior in 2013, he had 72 receptions for 1,255 yards and 22 touchdowns. He has very good speed and runs nice routes, but he is also very likely to stay in the state of Texas. Orange (CA) Lutheran defensive end Keisean Lucier-South was offered by Michigan. I wrote up a scouting report on him last Friday. 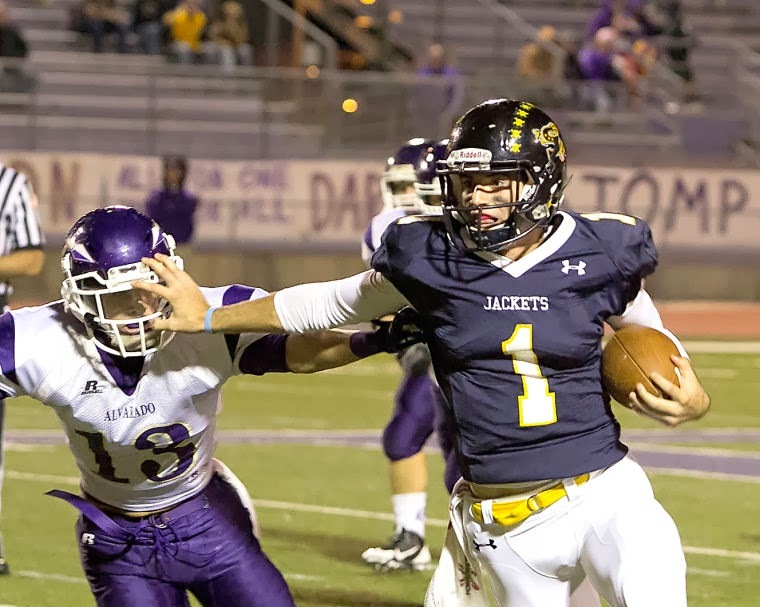 Stephenville (TX) Stephenville quarterback Jarrett Stidham was offered by Michigan. He's a 6'3", 190 lb. prospect with offers from Baylor, Clemson, Ohio State, Oklahoma State, Oregon, TCU, Tennessee, Texas, Texas A&M, and Texas Tech, among others. He's a 247 Composite 4-star, the #2 dual-threat QB, and #46 overall. As a junior in 2013, he completed 160/268 (60%) of his passes for 2,687 yards, 30 touchdowns, and 5 interceptions; he also ran 143 times for 975 yards (6.8 yards/attempt) and 16 touchdowns. Baylor appears to be the leader for Stidham, which would make some sense because head coach Art Briles was Stephenville's coach before moving on to the college ranks. Lawrenceville (GA) Central Gwinnett outside linebacker Adonis Thomas was offered by Michigan. He's a 6'4", 215 lb. prospect with offers from Florida, Florida State, Miami, Notre Dame, Ohio State, Oklahoma, South Carolina, Tennessee, Texas, and Texas A&M, among others. He's a 247 Composite 3-star, the #40 athlete, and the #376 player overall. Thomas is listed as an athlete partly because he plays receiver, but he's too stiff to be an offensive player at the next level. He looks like a SAM linebacker who may be able to grow into a weakside end at some point. Florida and Ohio State are two teams out front right now, and Michigan struggles to pull kids out of Georgia. Lawrenceville (GA) Central Gwinnett offensive tackle E.J. Price was offered by Michigan. He's a 6'5", 273 lb. prospect with offers from Auburn, Florida State, Miami, Ohio State, Oklahoma, and Wisconsin, among others. Price moves very well for a kid his size and should be a left tackle prospect going forward. Price is just the third lineman to have been offered for the 2016 class, following Erik Swenson (who is committed to Michigan already) and Thiyo Lukusa. Flower Mound (TX) Marcus tight end Kaden Smith was offered by Michigan. He's a 6'5", 235 lb. prospect with offers from Alabama, Clemson, Oklahoma, and Texas Tech. As a sophomore in 2013, he had 40 receptions for 640 yards (16 yards/catch) and 8 touchdowns. It's early, but Smith is expected to be one of the top couple prospects at his position in the 2016 class. He visited Ann Arbor last summer and appears to have more than passing interest, but the general expectation is that he will stay down south. His school is the alma mater of former Michigan running back Stephen Hopkins. Houston (TX) Cypress Falls outside linebacker Otaro Alaka flipped from Texas to Texas A&M. 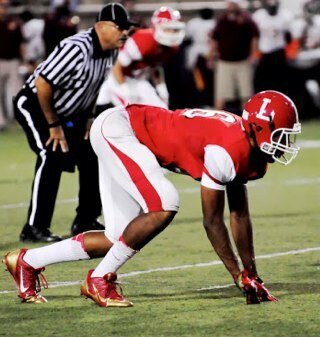 Manalapan (NJ) Manalapan wide receiver Saeed Blacknall flipped from Rutgers to Penn State. Blacknall was the prize recruit remaining in the Rutgers class that has seen a great deal of attrition in the last couple months, including Michigan running back offeree Jonathan Hilliman (Boston College) and Detroit Country Day quarterback Tyler Wiegers (Iowa). Goodyear (AZ) Desert Edge outside linebacker Ismael Murphy-Richardson committed to Arizona State. He never exhibited interest in his Michigan offer. Ventura (CA) St. Bonaventure quarterback Ricky Town decommitted from Alabama and then committed to USC shortly afterward. Town is considered to be one of the top few quarterbacks in the 2015 class, and while he does not hold a Michigan offer, he was recruited to the Crimson Tide by offensive coordinator Doug Nussmeier, who now holds the same position for the Wolverines. Michigan has thrown out a few offers for 2015 quarterbacks but is yet to really ignite a ton of interest, so it's worth watching Town and others. I would not expect Town to have serious interest in the Wolverines even if offered, but this is interesting because Elkton (MD) Eastern Christian Academy quarterback David Sills - who holds a Michigan offer - has been committed to USC for several years. Chandler (AZ) Hamilton offensive tackle Casey Tucker committed to Stanford. Tucker was committed to USC at one time and briefly flirted with interest in playing at Michigan, but he never visited Ann Arbor. Shane Ryan has a piece of the combination of John Beilein and Nik Stauskas, which seems to be working out pretty well in Ann Arbor right now. Hit the jump for Diana Morales in a black bikini. Rising fifth year senior nose tackle Richard Ash was granted a transfer release and will not return to Michigan in 2014. His destination is unclear at this point, but I would expect him to end up at a MAC level school or at the FCS level. Ash committed to Michigan in December 2009 after flipping his commitment from West Virginia. He was a 263 lb. player coming out of high school, and I assumed that he would chisel his body into becoming a 5-tech defensive end or perhaps a 3-tech tackle. However, he was 300 lbs. when he arrived on campus, which is obviously a ways away from his high school weight. Recruiting analysts mentioned that he was a better player when he was 240 or so as a junior, so his weight when he arrived in Ann Arbor was an immediate red flag to me. Ash settled in at nose tackle for the duration of his career, but he never made an impact on the field. After redshirting as a freshman, he appeared in 14 games from 2011-2013 and finally made his first (and only) career tackle in the regular season finale against Ohio State. This departure leaves Michigan somewhat thin at nose tackle with last year's starter Quinton Washington graduating and presumed new starter Ondre Pipkins coming off a torn ACL. Other options include redshirt sophomore Willie Henry, redshirt freshman Maurice Hurst, redshirt sophomore Ryan Glasgow, redshirt freshman Henry Poggi, and incoming freshmen Brady Pallante and Bryan Mone. Henry has shown the most promise, but he played 3-tech defensive tackle last season. Regardless of which players are on the two-deep at nose tackle, there will likely be some reshuffling on the defensive line. Ash may not have seen significant playing time in 2014, but he was an insurance policy in case of injury. Along with safety Josh Furman (I'll have a separate post for Furman), this is the nineteenth (19th!) player to depart from the 27-man class before exhausting his eligibility. Courtney Avery, Jibreel Black, Drew Dileo, and Jeremy Jackson played all four years, so the only remaining members are QB Devin Gardner, P Will Hagerup, TE Jordan Paskorz, and LB Jake Ryan. Robert Mays talks about the recipe that put the Denver Broncos in the Super Bowl against the Seahawks. Hit the jump for a tan girl in a bikini. 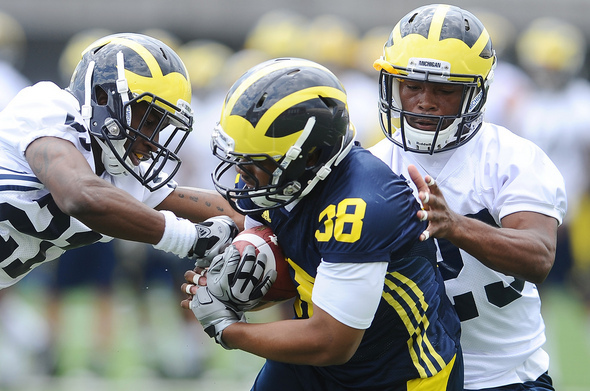 Soon-to-be senior running back Thomas Rawls will not be a senior at the University of Michigan. He has decided to transfer to Central Michigan, which is something that I've quietly been suggesting for a while. Rawls was a late addition the 2011 recruiting class, needing some late academic success to propel him toward a scholarship at Michigan. He was probably headed to CMU if not for the offer to play in Ann Arbor, so this development is approximately three years in the making. My commitment post from February 2011 suggested that Rawls would be in over his head a little bit in the Big Ten, and I gave him a TTB Rating of 68. I always believe that Rawls was too slow and lacked elusiveness, and he didn't break as many tackles as a 5'10", 217 lb. running back should. Rawls played sparingly during his three seasons as a Wolverine behind a variety of mediocre-performing running backs like Fitzgerald Toussaint (who did have a good year in 2011), Vincent Smith, Derrick Green, and De'Veon Smith, among others. His most productive season was as a sophomore in 2012 when he had 57 carries for 242 yards (4.2 yards/carry) and 4 touchdowns; that year included his career highlight, a 63-yard touchdown run late in a blowout win over Illinois. This past season, he had 3 carries for 12 yards and 1 touchdown in the season opener against his future team, but he never saw another snap again at running back and was relegated to special teams duty. He finished his Michigan career with 73 carries for 333 yards (4.6 yards/carry) and 5 touchdowns, plus 1 catch for 6 yards. This leaves Michigan with four tailbacks on the roster for 2014: redshirt junior Justice Hayes, redshirt sophomore Drake Johnson, and sophomores Derrick Green and De'Veon Smith. 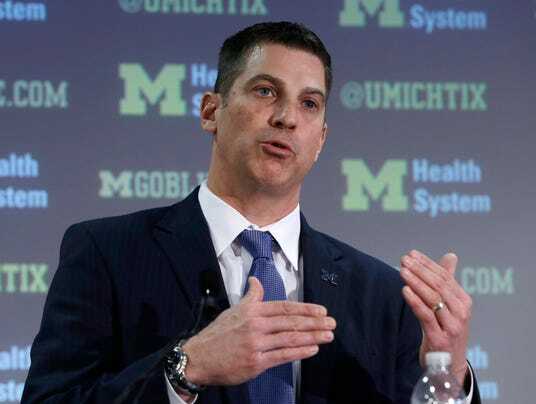 The Wolverines have recently sent out offers to Sarasota (FL) Booker's Marlon Mack and Minneapolis (MN) Washburn's Jeff Jones, but neither appears to be even planning to visit Michigan, even though Mack decommitted from UCLA as soon as the Wolverines offered him. It would appear to make sense for Michigan to grab a running back before National Signing Day in a couple weeks, but things are quiet on that front right now. The last time Michigan skimped on an important position in a recruiting cycle, they didn't take a quarterback in the 2012 class, which left them in a bind when Denard Robinson and Russell Bellomy got injured at various points. Rawls is the eighth member of the 2011 class to depart prior to exhausting eligibility, joining Chris Barnett, Greg Brown, Tamani Carter, Kellen Jones, Antonio Poole, Tony Posada, and Chris Rock. The Senior Bowl will be played today at 4:00 p.m. EST on the NFL Network. Michigan's lone representative is offensive lineman Michael Schofield, who's been slotted at guard after playing most of his career at offensive tackle. Mike Mayock and the guys covering the Senior Bowl have some positive things to say about Michigan right tackle Michael Schofield. Hit the jump for Jalien Reyneke with a deep cut bathing suit. Projection: Weakside end. The key for Lucier-South will be whether he maintains his athleticism while he adds weight, because he's very thin now. If he can maintain his speed and change of direction, he should be able to remain at weakside end and give offensive tackles fits with his length and quickness. If that speed starts to dwindle once he adds another 40-50 lbs. of muscle, then he may need to move to strongside end. He plays with enough leverage to take on tight ends and tackles on the strong side, so that wouldn't spell disaster for him. Perhaps the most encouraging thing is his pursuit angles, which combine with his understanding of leverage to suggest that he comprehends the game on a higher level than "see ball, get ball." Also, Maxpreps named his school's league (the Trinity League) as the #2 most difficult conference in the nation, so he's having success against quality competition. That league includes St. John Bosco (Josh Rosen, Jaleel Wadood, Damien Mama) and Mater Dei (Matt Barkley, Matt Leinart, Max Wittek), among others. Reminds me of: Taco Charlton. Michigan hasn't successfully recruited many guys like Lucier-South in recent years, so while I think Lucier-South is more refined as a player than Charlton was, they are comparable when it comes to size and natural athleticism. Likelihood of committing to Michigan: Lucier-South has been pining for a Michigan offer for a long time and called Michigan his "dream school." Still, he lives on the west coast and is being pursued by the likes of Notre Dame, Texas, and USC, so there's no shortage of suitors to try to convince him otherwise. No other strong leaders appear to have emerged, so I think Michigan has as good of a shot as anyone. Nick Baumgardner reviews how last week went for Jeremy Gallon, who was Michigan's lone representative in the East-West Shrine Game. Hit the jump for a Claudia Sampedro in a tanktop. Mailbag: How important is each position coach? Thank you for the great content on your site. I was thinking recently about position coaches, especially with the happenings at Michigan regarding our new OC/QB coach and speculation about the OL coach and how long Fred Jackson may stay on. There's always a grass is greener attitude among fanbases, and Michigan is no exception. Your honesty is probably the least susceptible to this way of thinking, which is refreshing. In this regard, I was thinking it might be a good piece for your blog to discuss the relative importance of each position coach. For instance, on average which is better to have for developing players--a good RB coach or a good OL coach? Is the RB position naturally more about athleticism and instinct, and so only so much can be taught? Is it the opposite? A rank-order list of all position coaches (+ coordinators maybe?) with explanations would be interesting. This might help frame the discussion about hiring/firing coaches, helping to give a sense of the net gain/loss of a particular staff member. I would assume this would be based mostly on your experience in coaching, and thus subjective, but I still think it would be a valuable piece. Just my 2 cents, keep up the good work! First of all, thanks for the compliments, and thanks for reading. I wish I could you a more definitive answer, but unfortunately, your question dips its toes into a bit of a gray area. As with any work place or administrative team, I think it's good to mix and match personalities and strengths. For example, a bunch of screamers and drill sergeants might not get the best out of the guys who take to more positive feedback. Having a group of 10 "players coaches" leaves room for the guys on the team to take advantage of the men who are their leaders. By the same token, some guys who are brilliant tacticians might not be great teachers. Personally, I work with one guy who's inexperienced and doesn't understand a whole lot about football concepts, but he's a motivator who gets his players excited and competitive. Obviously, almost every guy who coaches at the FBS level is going to have a good grasp of football, although they're clearly not all geniuses. You also have to be concerned about their ability to recruit, their ability to set a good example, etc. So there's a lot that goes into coaching besides X's and O's. As for your specific question about whether a good developer of talent is more necessary at offensive line or running back, I think the offensive line coach is clearly more important. Not only is he responsible for five guys up front (and the backups), but a poor offensive line can submarine an offense and consequently a team. There are some finer points of teaching running backs that a lot of people don't realize, but a running back can get by on a fair number of plays with sheer talent. That's why freshman running backs step in frequently and have success. For example, a running back on an outside zone play has some minor footwork assignments and is told to aim two yards outside the tight end or tackle; after that it's all about eluding the guys in the opposite colored jersey. Meanwhile, his offensive linemen have the same footwork assignments, but they have pre-snap reads, angles, hand placements, combo blocks, etc. throughout the outside zone play. Aside from the quarterback position, I believe offensive line is the toughest position to coach and learn. Head coach: Everything comes downhill, good or bad. He's the one who's the face of the program and sets the tone for his coaches and players. This is probably obvious. Defensive coordinator: A shoddy defense can really take the wind out of any team's sails. Although we've seen each side let down the other in recent years (Rodriguez's defense let down the offense, Borges's offense let down the defense), I think it's demoralizing for the team and the fans in the stadium when your defenders can't get off the field. If your defense gets the job done, a big play or two might help win a game even when the offense is stumbling. Offensive coordinator: The biggest thing for an offensive coordinator, in my opinion, is to utilize his personnel properly. In Michigan's case, I don't think Al Borges got the best out of Denard Robinson or Devin Gardner, even though the latter set some passing and total offense records. I also don't think Borges's offense was coherent enough to fit Michigan's offensive line. Teams can be successful with simplified offenses, as long as they know how to execute against any front, coverage, blitz, etc. Quarterback coach: Quarterback is the most important position on the field. Therefore, the guy needs the best tutelage he can possibly receive. Turnovers, incompletions, miscommunication, etc. can all undermine an offense's goal and a team's confidence. Conversely, good quarterback play can elevate and inspire a team. Offensive line coach: As mentioned above, I believe the offensive line is the second-most difficult position group to coach. Along with having to coach five positions, each player has his own unique strengths, weaknesses, footwork, stance, reads, etc. Even if you have great skill players, you can't win if you can't block up front, because the ball can't get distribute properly. Linebacker coach: This is a very difficult choice here between the linebackers and defensive linemen, but linebacker is a very technical position, and one false step or bad read can be the difference between no gain or a huge gain. Linebackers also have the somewhat unique responsibility of being involved in the run and the pass. One of the linebackers (usually the MIKE) is typically the captain or field general of the defense, and he has to make sure that all the guys in the front seven are on the same page. Defensive line coach: Going along with what I said about the defensive coordinator, a poor defense can spell disaster for the team. I don't think you have to have a ton of playmakers on the defensive line, but you have to have guys who can do their job adequately so the linebackers and defensive backs can do their own thing without having to cover up for the line's deficiencies. Much like the offensive line, you can win or lose an individual battle with a slightly different hand placement, stepping two inches shorter or farther, stepping at a 45' angle instead of a 90' angle, etc. Defensive back coach: Some guys in the secondary can get by on pure athleticism, but a lot of guys have to understand route combinations, splits, formations, etc. I think technique with cornerbacks can be pretty easy to teach because those guys are so coordinated and fluid in the first place, but the mental aspect can give those guys the edge they need to make a difference between a short completion and a pass breakup, a pass breakup and a pick, etc. Running back coach: While the running back position seems easy to play, there are a lot of things that good running backs do to help out a quarterback and an offense. Awareness of the blitz, knowing how the linebackers are going to flow, etc. can help in the passing game. Wide receiver coach: The wide receiver position is so much about athleticism that I don't think they need a lot of deep thought from a coach. There are lots of little techniques that can be taught (stance, release, body positioning, etc. ), but much like cornerbacks, they're typically smooth and coordinated enough to pick up on those things easily. I also think drills and such are easier to watch and correct in one-on-one or skelly situations during practice, whereas on the offensive line, the whole unit needs to be cohesive. Tight end coach: I think tight end is probably the easiest position to play or coach at a high level, provided you have the size, athleticism, strength, speed, etc. to do so. Just due to their alignment on the field, they either block down or arc release in the run game or they run pretty simple routes in the passing game (hitch, drag, seam, etc.). There are some finer nuances, like in the zone run game or if they split out wide, but generally, there are a finite number of techniques and a small number of guys to coach. I hope this helps answer your questions. I've never really thought about the topic before, so it's a fresh idea to me, too. The Detroit News released their Blue Chip list for the class of 2014, and there are several Michigan commits and targets. Hit the jump for a brunette. Berea (KY) Madison Southern running back Damien Harris officially decommitted from Michigan yesterday, which is the second huge decommitment from Michigan's 2015 class, following Tarpon Springs (FL) East Lake wide receiver George Campbell. He originally committed to the Wolverines last August after being offered in the summer of 2012 when he camped in Ann Arbor. In fact, he was the first player to be offered by Michigan in the 2015 class. While no definitive reason has been stated for rescinding his pledge, his family was apparently fond of former offensive coordinator Al Borges; with Borges out the door and Michigan's 15-11 record over the past two seasons, it's somewhat understandable that the 247 Composite #2 running back would have second thoughts. However, it's still disappointing for a Michigan fan base who expected that Harris's love for his childhood favorite would carry him through to National Signing Day in February 2015. New offensive coordinator Doug Nussmeier and running backs coach Fred Jackson visited Harris in his hometown recently, and obviously, Harris wasn't 100% comfortable with the situation. His mother has told recruiting outlets that the Wolverines are still #1 on Harris's list, but the vast majority of kids who decommit end up choosing another school. Michigan has a few options at this point. They immediately responded by offering Princeton (NJ) Princeton 3-star running back Johnny Frasier, who holds a middling offer list. Detroit (MI) Cass Tech runner Mike Weber has had an offer for a while, but he has stated that Michigan wasn't recruiting him very hard, so it might be hard to get back in the race with him after teams like Michigan State and Tennessee have worked on him. Orlando (FL) Timber Creek's Jacques Patrick has a cousin who coaches in Detroit, and Plano (TX) West's Soso Jamabo holds an offer as well, but both of those players seem like longshots. Despite a couple mediocre seasons, Michigan still has the brand name and the television presence to pull kids in from around the country. Nussmeier has some different connections and some different philosophies, so it will be interesting to see which players get offered next. Two names I plan to keep an eye on are Hubbard (OH) Hubbard's Larry Scott and East St. Louis (IL) East St. Louis running back Natereace Strong, a teammate of linebacker Kyron Watson, a Kansas commit who was offered in the 2014 class. For other news on ex-Wolverines, you can check out the Ex-Wolverine Encyclopedia. 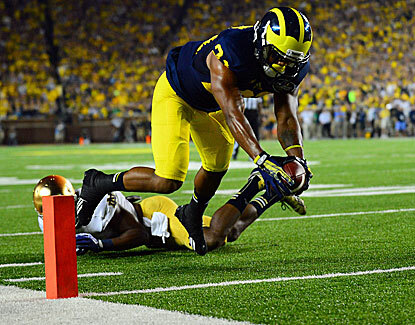 Mark Schlabach put together an early top 25 for the 2014 season, and Michigan checks in at #24. Hit the jump for Emily Sears in a blue bikini. Sam Webb put together an article on Drake Harris, who missed his entire senior year with a hamstring injury. Hit the jump for a girl in a black bikini. You won't be disappointed. Sarasota (FL) Booker running back Marlon Mack (offense, defense) was offered by Michigan. Mack is a 6'0", 195 lb. prospect with offers from Indiana, Louisville, South Florida, and UCLA, among others; he was committed to the Bruins until a few days ago. He's a 247 Composite 3-star, the #98 athlete, and the #1,117 player overall. Mack claims a 4.5 forty and shows the speed on film, but he's not a polished running back and more of an athlete who runs the ball. The reason I linked his offensive and defensive highlights separately above is that he has a chance to play safety or maybe even corner in college, and I would lean toward him having higher upside at safety. 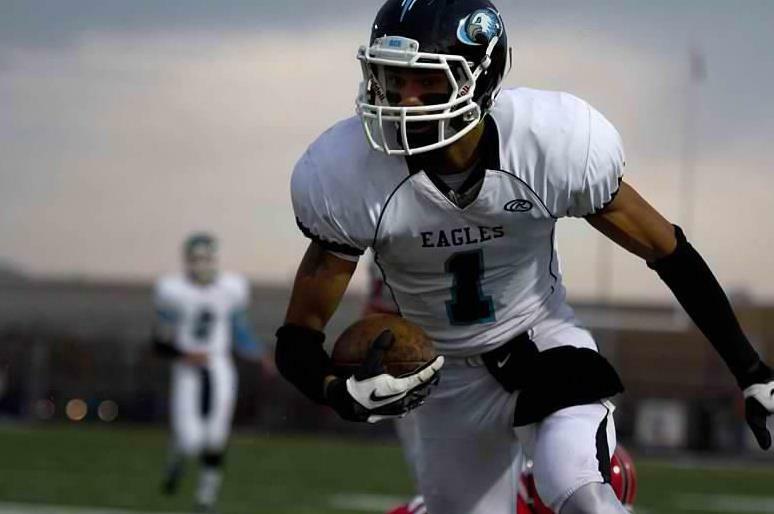 He has good range and is a very physical hitter from the defensive back position. However, he appears to prefer running back, and that's the position where Michigan is recruiting him at this time. The Wolverines are also in hot pursuit of Minneapolis (MN) Washburn running back Jeff Jones, and while signs are positive for Jones to Michigan, Mack decommitted from UCLA as soon as he was offered by Michigan assistant coach Jeff Hecklinski. Both running backs are planning January 31st official visits to Ann Arbor, so it will be a very interesting race to see who commits first. I believe Michigan will get at least one of the two, but Mack's versatility could mean that he has a spot whether Jones commits or not. Tampa (FL) Plant offensive tackle Jake Fruhmorgen was offered by Michigan. Fruhmorgen is a 6'5", 280 lb. prospect with offers from Alabama, Auburn, Clemson, Florida, Florida State, Georgia, Miami, Notre Dame, Ohio State, Penn State, South Carolina, and Wisconsin, along with lots of others. He's a 247 Composite 4-star, the #6 offensive tackle, and #75 overall, and he's already committed to playing in the 2015 Under Armour All-American Game. Fruhmorgen has the feet to play tackle at the next level, but really, I think he could play either guard or tackle position. His father John was an offensive tackle at Alabama in the late 1980's and went on to play professionally, most notably for the Miami Dolphins. Memphis (TN) Whitehaven linebacker Joshua McMillon was offered by Michigan. McMillon is a 6'3", 230 lb. prospect with offers from Alabama, Auburn, Clemson, Georgia, Ole Miss, and Tennessee, among others. He's a 247 Composite 4-star, the #13 outside linebacker, and #186 overall. McMillon is being recruited as a SAM linebacker by the Wolverines, but he looks like a guy who might be more likely to end up at weakside end in the future. On the plus side for Michigan, his head coach is a Michigan graduate and he's interested in early playing time, which could work out for him with starter Jake Ryan graduating after 2014 and no heir apparent. On the negative side, McMillon has stated that his "dream school" is Alabama. Detroit (MI) King linebacker Tyriq Thompson was offered by Michigan on Thursday. Thompson is a 6'2", 210 lb. prospect with offers from Michigan State, North Carolina State, Northwestern, and Wisconsin, among others. He's a 247 Composite 3-star, the #23 outside linebacker, and the #448 player overall. As a junior in 2013, he had 142 tackles, 10 sacks, 7 pass breakups, and 4 forced fumbles. Thompson moved from Missouri to Michigan prior to the 2013 season. His stature and stance make him look a little like James Ross, but Thompson plays a little slower. Michigan State was presumed to be the leader until Michigan offered, so this new development makes things interesting. Thompson's father Clarence was a safety at Michigan in the mid-'90s, when he made 154 tackles, 7 interceptions, 11 pass breakups, 4 fumble recoveries, and 1 forced fumble from 1993-1995. Baltimore (MD) Gilman cornerback Troy Vincent, Jr. flipped from Penn State to North Carolina State. Obviously, he's the son of Troy Vincent, whom you may or may not remember as a Wisconsin Badger, Miami Dolphin, and Philadelphia Eagle. Michigan seems set at cornerback, and there was some question about how heavily the Wolverines pursued him in the first place. I took a look at the history of #1 rated cornerbacks in the Rivals era. Smart Football author Chris Brown writes about Pete Carroll's 4-3 Under defense. Hit the jump for a Barbie-looking girl. Poll results: What grade would you give the hiring of offensive coordinator Doug Nussmeier? This post doesn't really need much commentary on my end. I asked readers what grade they would give Michigan's hiring of Doug Nussmeier, and the vast majority give the hire an "A." For what it's worth, there were zero votes for "D" and then four votes for "F," so I have to imagine that a few Buckeye or Spartan trolls stumbled across the site. If those votes were from legitimate Michigan fans, I would be curious to know the reasoning. Thanks for visiting the site 12,000,000 times. Your reward is a string of fascinating pictures of attractive women. Josh Helmholdt and Jason Howell present some "awards" to the top performers during the week of the U.S. Army All-American Bowl. Hit the jump for a girl in a tight blue dress. Grand Rapids (MI) Christian wide receiver Drake Harris moved up two spots in the Scout 300 despite missing his senior season due to injury. The East-West Shrine Game will be played today at 4:00 p.m. EST and broadcast on the NFL Network. There's just one representative from Michigan, but there are several Big Ten players, guys we've seen play Michigan recently, and a few guys that Michigan recruited four or five years ago. Adam Rittenberg and Brian Bennett put together an all-star team of the best players during the now expired BCS era. It includes Michigan players Braylon Edwards, Steve Breaston, Jake Long, and LaMarr Woodley. Hit the jump for a bikini-clad girl in the wild. Paramus (NJ) Catholic cornerback Jabrill Peppers is the top player at his position in 2014. Just like last year, I wanted to take a gander at the history of Rivals' top-rated players at one certain position. Thanks to Derrick Green, it was running back in 2013 (LINK). This time it's cornerback, thanks to Paramus (NJ) Catholic's Jabrill Peppers, who is ranked as the #1 cornerback in the 2014 class and happens to be committed to the Wolverines. Here's a look at the Rivals #1 cornerbacks since the company's creation. Leon Washington - CB - Jacksonville (FL) Andrew Jackson (#9 overall): Washington was the top corner in the 2002 class, but he didn't spend a single season at Florida State playing defense. Instead, he became a scatback for the Seminoles, totaling 369 carries for 2,041 yards (5.5 yards/carry) and 12 touchdowns. He also caught 55 passes for 481 yards and 1 touchdown. He was also an effective but unspectacular returner in Tallahassee, averaging 11.1 yards/punt return and 24.8 yards/kick return with 1 touchdown in each category. The New York Jets drafted him in the 4th round (#117 overall) of the 2006 NFL Draft. In a nine-year NFL career, he has 474 carries for 2,214 yards (4.7 yards/carry) and 16 touchdowns. He has 146 catches for 1,127 yards and 2 touchdowns. He has also averaged 10 yards/return on 174 returns. But where he has made his biggest impact is as a kick returner, where he has returned 261 kickoffs for 6,815 yards (26.1 yards/return) for 8 touchdowns, the latter of which is tied for an NFL record. He was named to the Pro Bowl in 2008 and 2012 and is currently a member of the Tennessee Titans, where he was exclusively a returner in 2013. Paul Oliver - CB - Kennesaw (GA) Harrison (#9 overall): Oliver is the saddest story on the list. He redshirted as a freshman at Georgia in 2003 and then became a backup for a couple years. As a redshirt freshman, he had 9 tackles, 1 sack, and 1 interception. Then he had 28 tackles and 3 interceptions as a redshirt sophomore. Finally earning a starting gig as a redshirt junior, he had 57 tackles, 6.5 tackles for loss, 2 sacks, 3 interceptions, and 6 pass breakups. He entered the NFL's Supplemental Draft in 2007 and finished his career with 94 tackles, 8.5 tackles for loss, 3 sacks, and 7 interceptions. The San Diego Chargers drafted him in the 4th round, and he spent the 2008-2011 seasons with the team, totaling 96 tackles, 4 interceptions, 1 forced fumble, and 3 fumble recoveries, 1 of which he returned for a touchdown. After being out of the game for a couple years, Oliver committed suicide in front of his wife and children in September 2013. Theodore Ginn, Jr. - CB - Cleveland (OH) Glenville (#2 overall): Ginn was a receiver right off the bat at Ohio State, catching 135 passes for 1,943 yards (14.4 yards/catch) and 15 touchdowns in his three years in Columbus. He also ran the ball 28 times for 213 yards and 3 touchdowns, averaged 14.1 yards/punt return with 6 touchdowns, and averaged 26.6 yards/kick return with 2 touchdowns. He developed into an All-Big Ten player and a Second Team All-American. He left the Buckeyes after three seasons to become the #9 overall pick in the 2007 NFL Draft by the Miami Dolphins. In seven years with Dolphins, San Francisco 49ers, and Carolina Panthers, he has totaled 197 catches for 2,604 yards (13.2 yards/catch) and 11 touchdowns, along with 31 rushing attempts for 239 yards and 2 touchdowns. He has also averaged 11.2 yards/punt return for 3 touchdowns and 23.3 yards/kick return for 3 touchdowns. Justin King - CB - Monroeville (PA) Gateway (#19 overall): King was a two-way player when he first arrived at Penn State, catching 10 passes for 126 yards and 2 touchdowns, running 18 times for 227 yards, and notching 11 tackles and 2 pass breakups as a true freshman in 2005. After that he was a full-time defender. He had 30 tackles, 1 interception, and 6 pass breakups as a sophomore in 2006, then 49 tackles, 2 interceptions, and an impressive 15 pass breakups as a junior in 2007. His junior year earned him First Team all-conference honors. He left early for the NFL Draft and was picked in the 4th round (#101 overall) in 2008, going to the St. Louis Rams. In a five year career with the Rams, Indianapolis Colts, and Pittsburgh Steelers, he notched 116 tackles, 1 sack, 1 interception, and 11 pass breakups. He has not played in the NFL since 2012. A.J. Wallace - CB - Pomfret (MD) McDonough (#19 overall): Much like King, Wallace was a two-way player in his first year at Penn State before concentrating on defense. As a freshman in 2006, he had rushed 8 times for 153 yards and 1 touchdown, caught 1 pass for 5 yards, returned 16 kickoffs for 388 yards, and made 10 tackles on defense. As a sophomore in 2007, he was a part-time starter at cornerback and made 33 tackles, 1 interception, 3 fumble recoveries, and 4 pass breakups; he also set the PSU school record with 581 kickoff return yards, averaging 26.4 yards/attempt and scoring a 97-yard return touchdown. In 2008 as a junior, he had 20 tackles and 2 pass breakups as a part-time starter once again. As a senior in 2009, he earned a starting job and made 39 tackles, 1 tackle for loss, 3 interceptions, and 3 pass breakups. He went undrafted in the 2010 NFL Draft and signed with the Miami Dolphins but was cut before playing in a game. He has bounced around between the Arena league and the Canadian Football League since then, but does not currently appear on a roster to my knowledge. Eric Berry - CB - Fairburn (GA) Creekside (#3 overall): Berry hit the field as a safety at Tennessee with a bang, earning Second Team All-SEC and Freshman All-American honors. He had 86 tackles, 2 tackles for loss, 5 interceptions, 2 fumble recoveries, 1 forced fumble, and 9 pass breakups. As a sophomore in 2008, he was a unanimous All-American with 72 tackles, 8.5 tackles for loss, 3 sacks, 7 interceptions, and 13 pass breakups; he also rushed 7 times for 37 yards. Then he was a unanimous All-American again in 2009 and won the Jim Thorpe Award with 89 tackles, 7 tackles for loss, 2 interceptions, 1 forced fumble, 2 fumble recoveries, and 9 pass breakups. He was selected #5 overall in the 2010 NFL Draft by the Kansas City Chiefs. The only thing that has stopped Berry in the NFL has been a torn ACL in 2011. Otherwise, he has been named to the Pro Bowl in 2010, 2012, and 2013, totaling 252 tackles, 2.5 sacks, 8 interceptions (3 returned for touchdowns), and 29 passes defensed. Patrick Johnson (now Patrick Peterson) - CB - Pompano Beach (FL) Blanche Ealy (#5 overall): Johnson started four games as a freshman at LSU in 2008, totaling 41 tackles, 1.5 tackles for loss, 1 interception, 1 forced fumble, and 3 pass breakups. He became a full-time starter as a sophomore in 2009 when he made 52 tackles, 2 interceptions (1 returned for a touchdown), 13 pass breakups, and 1 blocked field goal returned for a touchdown. As a junior in 2010, he made 42 tackles, 1.5 tackles for loss, 4 interceptions, blocked 1 kick, and broke up 6 passes; he also came into his own as a returner, averaging 16.1 yards/punt return with 2 touchdowns and averaging 29.1 yards/kick return. For his efforts as a junior, he was named the SEC Defensive Player of the Year, won the Jim Thorpe Award, won the Bednarik Award, and was named First Team All-America. He entered the draft a year early and was taken #5 overall by the Arizona Cardinals, for whom he has been named to the Pro Bowl in 2011, 2012, and 2013. He tied a record for most punt return touchdowns in a season as a rookie in 2011, also setting the rookie mark for punt return yardage. Altogether, he has 161 tackles, 1 sack, 12 interceptions, and 42 passes defensed; he averages 10.3 yards/punt return with 4 career touchdowns and has also made some cameo efforts passing, running, and catching the ball for the Cardinals. Dre Kirkpatrick - CB - Gadsden (AL) City (#11 overall): Kirkpatrick was a backup in his first season at Alabama, where he made 8 total tackles. As a sophomore in 2010, he earned a starting cornerback job and made 53 tackles, 4 tackles for loss, 3 interceptions, 7 pass breakups, 1 forced fumble, and 1 fumble recovery. He was Second Team All-SEC and All-America in 2011, when he had 30 tackles, 4 tackles for loss, 9 pass breakups, and 2 forced fumbles. He left a season early and was drafted #17 overall by the Cincinnati Bengals in the 2012 NFL Draft. Hampered by injuries so far, he has 34 tackles, 3 interceptions (1 for a touchdown), 1 sack, and 7 passes defensed over two seasons. Lamarcus Joyner - CB - Fort Lauderdale (FL) St. Thomas Aquinas (#14 overall): Joyner has been all over the magazines, blogs, sports channels, etc. in recent weeks after his Florida State Seminoles reached and won the national championship. As a true freshman backup in 2010, he made 23 tackles, 1 interception, and 3 pass breakups while averaging 20.6 yards per kick return. In 2011 he became a starting safety, racking up 54 tackles, 2 tackles for loss, 1 sack, 4 interceptions, and 3 pass breakups on his way to being named Second Team All-ACC; he also averaged 30.5 yards/kick return. He then totaled 51 tackles, 1.5 tackles for loss, 1 interception, and 5 pass breakups as a junior in 2012 and averaged 23.6 yards/kick return. As a senior in 2013, he moved to cornerback and ended the year as the second-leading tackler with 69 stops, 7.5 tackles for loss, 5.5 sacks, 2 interceptions, 4 pass breakups, and 3 forced fumbles. NFL Draft Scout ranks him as the #6 cornerback and the #54 overall prospect for the 2014 NFL Draft. Malcolm Mitchell - CB - Valdosta (GA) Valdosta (#30 overall): The only 4-star on this list (all other top-ranked corners were 5-star prospects), Mitchell has ended up primarily as a receiver at Georgia. As a freshman in 2011, he was exclusively an offensive weapon, catching 45 passes for 665 yards and 4 touchdowns and carrying 4 times for 38 yards. As a sophomore in 2012, he played some defense but caught 40 passes for 572 yards and 4 touchdowns; he also ran 5 times for 32 yards, averaged 22.5 yards/kick return, and made 12 tackles, 3 pass breakups, and 1 fumble recovery. In Georgia's 2013 season opener, he unfortunately tore his ACL simply jumping up and down after running back Todd Gurley scored a touchdown in the first quarter; he will likely return to the team in 2014 as a redshirt junior. Tracy Howard - CB - Miramar (FL) Miramar (#13 overall): Howard was a backup at Miami as a true freshman in 2012, making 17 tackles and 4 pass breakups while starting one game. Starting at cornerback in 2013, Howard made 35 tackles, 1 tackle for loss, 4 interceptions, 1 pass breakup, and 1 forced fumble. He will be a junior for the Hurricanes in 2014. Vernon Hargreaves III - CB - Tampa (FL) Wharton (#2 overall): Hargreaves was a Third Team All-American as a true freshman at Florida in 2013, when he started ten games and made 38 tackles, 3 interceptions, and 11 pass breakups. He was also a First Team All-Freshman All-American and First Team All-SEC. He will be a sophomore for the Gators in 2014. 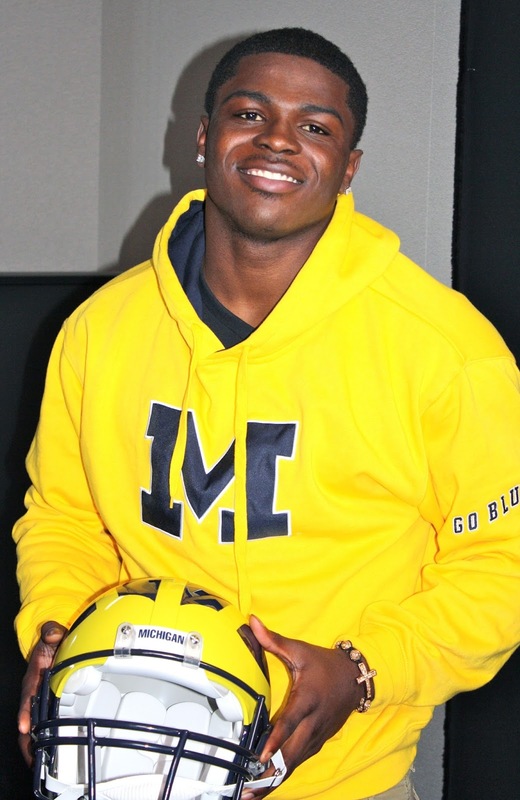 Jabrill Peppers - CB - Paramus (NJ) Catholic (#2 overall): ??? I was a little surprised when I went through this list and saw that there were several guys who underperformed. Typically, it seems that positions based on visible athletic skill are pretty consistent and easier to scout than linemen and linebackers, but this is a hit-and-miss group. It makes sense that elite cornerbacks - who are often the most athletic guys on the field - might end up at running back, wide receiver, or safety in college, just because they have they often have the ability to excel at numerous positions. Performances are all over the place, too. Patrick Peterson and Eric Berry are the only guys to have turned into dominant players, while Kirkpatrick and Ginn turned into very good but not great players. Hargreaves and Howard still have a chance to make it to that level, while Joyner is probably another slight step down. 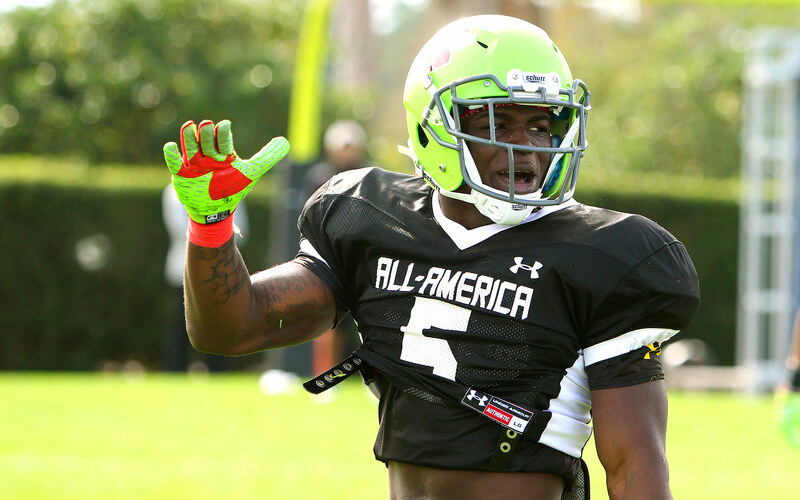 So what can Michigan expect from Jabrill Peppers, assuming he signs with Michigan next month? Well, based on the history of the ranking at the position, he will almost certainly contribute in multiple phases of the game. Defense and special teams are near certainties, and he has been told that he will get a chance to contribute on offense, too. At 6'0" and 205 lbs., he has the build of a guy who could play running back or safety full-time. Physically, the best comparison is probably Berry, who is listed at 6'0" and 211 lbs., although I hesitate to immediately anoint him a Jim Thorpe Award winner and a top-five selection in the NFL Draft in five years. However, after floundering during the first several years of Rivals' existence, they seem to have hit their stride with a string of choices like Berry, Peterson, Kirkpatrick, Joyner, Howard, and Hargreaves. The presence of Mitchell reinforces that the process isn't foolproof, but as a reminder, he was the only guy not to receiver 5-star status. Recent evidence suggests that Peppers should be a very good college player, bordering on All-America and first round draft pick status.